Unstructured data analysis is one of the most interesting aspects of “big data”. It’s certainly impressive to be able to process massive amounts of structured data in no time, but analyzing unstructured data opens completely new possibilities, that can lead to the creation of whole new disciplines or industries. 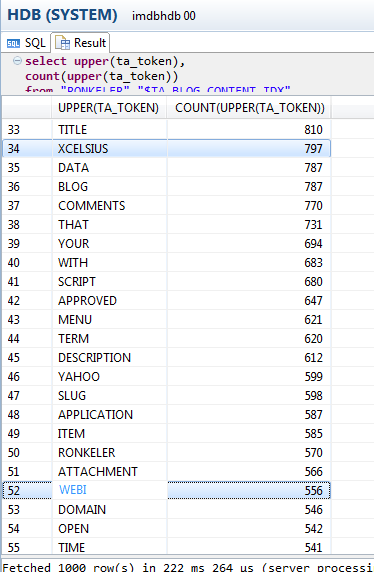 To test out HANA text analysis capabilities, I thought I would try to load my blog into a column table, and see what it can do. Leveraging my company AWS HANA instance, I started out by making a simple single column table. The important thing to note here is that for text analytics to work, the data type to be used has to be NCLOB. BLOB for example, will not work. The next step was a bit more interesting. How do I actually load my blog into the table…? Well. First, I had to get my blog out to a file. Since I use wordpress, that was as simple as selecting the Export option from the Tools menu of the administration section. 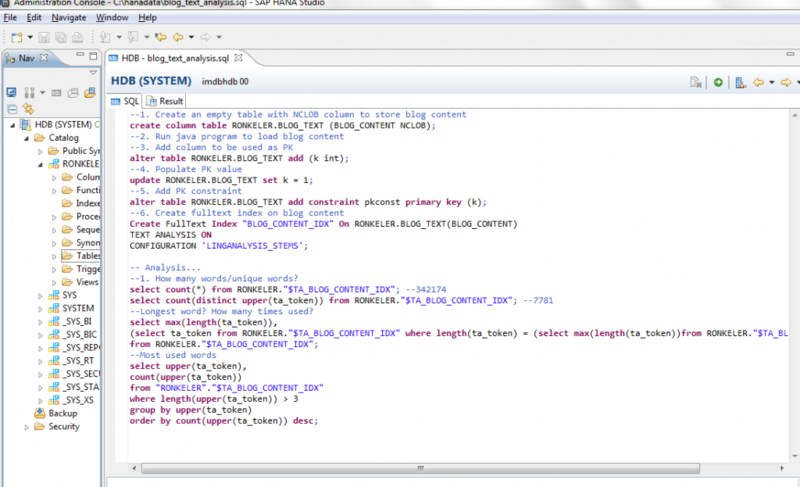 With my blog exported as an xml file, I set my sights on loading it into my table. Data Services would be my typical choice, as it’s fast, easy to use, and has great integration with HANA. However, to keep my options open, I looked for a programmatic solution that will allow more robust capabilities. And as it turns out, the solution was similar to loading a blob object into any other database. I ended up writing a small java program to load the file in. So far, things have been pretty standard. The cool part was turning on the text analytics. Using one simple SQL command, HANA processed the content of my text column, and parsed it out in nano seconds! --1. How many words/unique words? select count(distinct upper(ta_token)) from RONKELER. "$TA_BLOG_CONTENT_IDX"; --7781 unique words... Maybe i need to read more to expand my vocabulary..
--Longest word? How many times used? Of course, this is a tiny example, but the ability to store and quick and easily parse text can be an important feature in any HANA implementation. From social media content to corporate documents, this is a game changer! This entry was posted in SAP HANA and tagged HANA Java Programming, HANA Text analytics, HANA Unstructured data, Insert BLOB Into HANA. Bookmark the permalink.